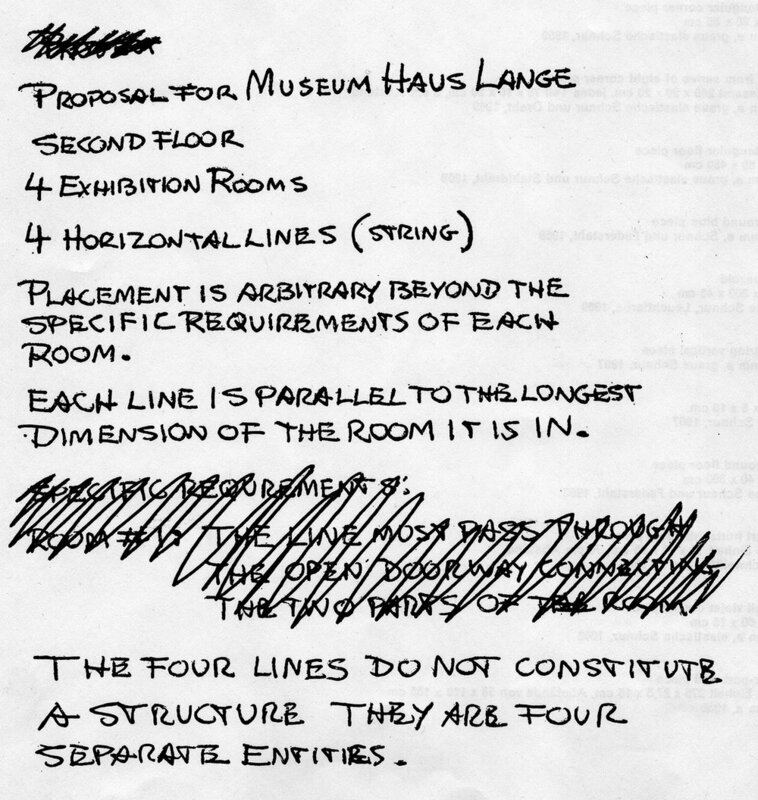 Fred Sandback: Five Situations; Eight Separate Pieces. Dwan Gallery, New York. January 4–29, 1969. Fred Sandback. Ace Gallery, Los Angeles. February 13–28, 1969. Fred Sandback: Installations. Museum Haus Lange, Krefeld, Germany. July 5–August 24, 1969. Here and Now. Washington University Gallery of Art, St. Louis, Missouri. January 11–February 21, 1969. Sammlung 1968 Karl Ströher. Neue Nationalgalerie, Berlin. March 1–April 14, 1969. Traveled to: Städtische Kunsthalle, Düsseldorf, April 25–June 17, 1969; Kunsthalle Bern, July 12–September 28, 1969. 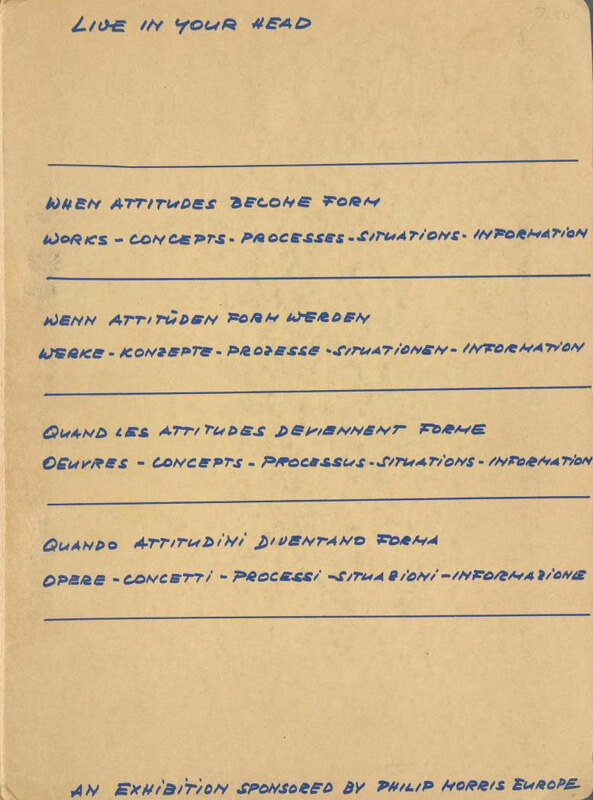 New Media—New Methods. Robertson Center, Binghamton, New York. March 16–April 13, 1969. Traveled to: Montclair Art Museum, New Jersey, March 4–25, 1969; University of South Florida, Tampa, July 28–August 21, 1969; George Thomas Hunter Gallery, Chattanooga, Tennessee, September 7–28, 1969; Krannert Art Museum, University of Illinois, Champaign-Urbana, October 12–November 9, 1969; Dulin Gallery of Art, Knoxville, Tennessee, December 1–22, 1969; Des Moines Art Center, Iowa, January 16–February 8, 1970; Memorial Art Gallery, Rochester, New York, March 6–29, 1970; Arkansas Arts Center, Little Rock, May 17–June 14, 1970; Edmonton Art Gallery, Alberta, July 13–August 16, 1970. Organized by the Museum of Modern Art, New York. Live in Your Head—When Attitudes Become Form. Kunsthalle Bern. March 22–April 27, 1969. Traveled to: Museum Haus Lange, Krefeld, Germany, May 10–June 15, 1969; Institute of Contemporary Art, London, September 28–October 27, 1969. Between Object and Environment. Institute of Contemporary Arts, University of Pennsylvania, Philadelphia. April 2–May 3, 1969. Contemporary American Sculpture; Selection 2. Whitney Museum of American Art, New York. April 15–May 5, 1969. New Materials: Procedures in Sculpture. Austin Arts Center, Trinity College, Texas. April 16–30, 1969. Hang Ups and Put Downs. Fine Arts Galleries, University of Wisconsin, Milwaukee. May 15–June 11, 1969. Language III. Dwan Gallery, New York. May 24–June 18, 1969. 557,087. Seattle Art Museum Pavilion, Seattle, Washington. September 5–October 5, 1969. Traveled as 955,000 to: Vancouver Art Gallery, January 13–February 8, 1970. Other Ideas. Detroit Art Institute. September 10–October 19, 1969. Konzeption—Conception. Dokumentation einer heutigen Kunstrichtung. Städtisches Museum, Schloss Morsbroich, Leverkusen, Germany. October 24–November 23, 1969. Drawings. Fort Worth Art Center, Texas. 1969. Recent Acquisitions. Rhode Island School of Design Museum, Providence. 1969.